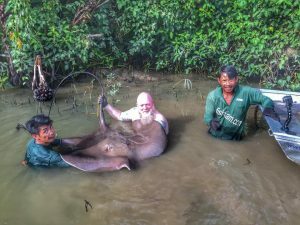 After fishing at the Maeklong River on the previous day and failing to catch any stingrays, Dutch angler Goris started his final day at the river. Once again as on the previous day baits were placed at various points across the tidal river in readiness for the arrival of the stingrays and the incoming tide. As the Maeklong River started to rise one of the baits was picked up by a Giant freshwater stingray which slowly moved away downstream. On winding down into the unseen fish the rod was arched over into a healthy curve as the angler lent into the Giant freshwater stingray. The Giant freshwater stingray powered off on several unstoppable runs stripping yards of line from the Okuma multiplier reel, before each time going to ground and clamping tightly to the riverbed. 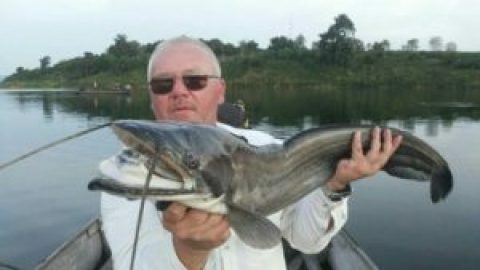 The battle lasted almost thirty minutes with the Dutch angler lifting the stingray off the bottom on several occasions only for the fish to dive back down into the depths. Finally the monster fish released its grip of the bottom and was slowly brought up to the waiting net. The Giant freshwater stingray was quickly secured alongside the boat before being transported to the side of the river. On inspection the Giant freshwater stingray was estimated to weigh 90-100 kg’s and was released after a few trophy shots.